You know how some people like to keep it classy and simple. We love people who keep their spectacles old-school. What better way to adorn yourself than go a little ‘vintage’. Providing the best platform to purchase titanium eyewear, Cheap Eyeglasses Online is here at your service. Our website deals with the amazing range of prescription glasses and sunglasses. Providing you the perfect opportunity to stay old-school, our titanium glasses are definitely what you need. 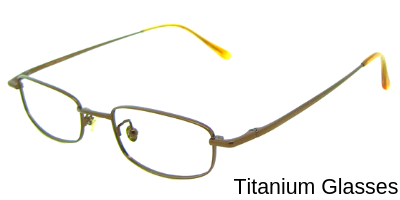 We have different styles and frames to make your titanium eyewear look trendier. We offer different frames in titanium for different personalities. If you want to look girly and sustain the femininity with titanium eyewear, our cat-eyes sunglasses are here to sustain your wishes! With our pinkish prescription glasses available in titanium frame, you will love to sport them all through the day! We also give men equal opportunity to flaunt their titanium frames in different styles and colors. We have oval framed prescription glasses available in grey and gold. Nothing says class than these two colors which add stylish dimension to your look. We also have the brownish frames which fade into a slight gold near the end of the rims. This frame is extremely trendy and says a lot about your personality. What is interesting about our eyewear is its ability to make you look good. Not every eyewear brand focuses on adding style and class to your attire. On the other hand, we make sure our eyewear adds, not ‘subtracts’ from your natural flair. With our reasonable priced prescription wear and sunglasses, we want to make sure we cater everybody. Our titanium glasses are suited for every age. They can be girly, masculine, classy and vintage for every kind of a person. With our uniqueness to represent style through your specs, there is nothing else you need!